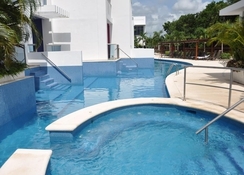 A short distance from the lively Playa del Carmen and nestled amid a blissful and stress-free ambience, the Grand Sunset Princess All Suites invites guests to relax at its 5-star resort. Located in Riviera Maya, the hotel has direct access to Playa del Carmen's beautiful powder-white sand beach, not to mention 16 fantastic swimming pools (varying in size and shape), a sumptuous spa with health, relaxation and beauty treatments, all day children's clubs, a fully equipped gym, plus access to services at neighbouring Grand Riviera Princess and more. Grand Sunset Princess boasts 12 select restaurants and 12 bars catering to all guests' dining needs, from intimate culinary experiences to breakfast settings overlooking the sea. The hotel's rooms are tastefully decorated and offer a balcony or terrace so guests can admire seafront views, plus they are all equipped with modern amenities to ensure a comfortable stay. 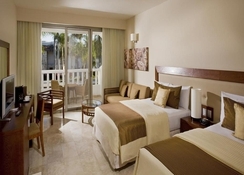 The Grand Sunset Princess All Suites is a short walk to the beach, located on the majestic Riviera Maya. 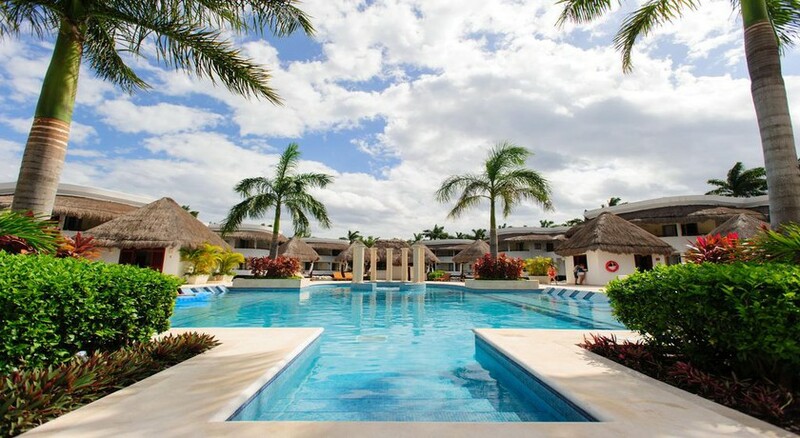 This 5-star resort is just 9km from Downtown Playa del Carmen, if you want to explore outside of the resort. Cozumel International Airport, being the nearest, is about a 15-minute drive. 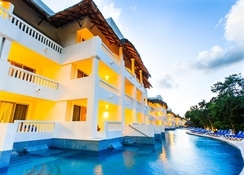 You can also arrive here from Cancun International Airport which is a 30-minute drive. The hotel complex has 672 rooms housed in several buildings. Guests can choose from Junior Suites, Junior Suite Deluxe, Junior Suite Deluxe Swimout, Platinum Suites and Laguna Villa Suites. 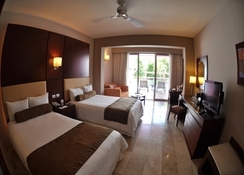 The hotel also offers premium accommodation categorised as Yucatán Platinum suites. All rooms have got a balcony or terrace, a flat screen TV and a packed-up mini bar. The suites are equipped with sofa bed in their living areas and a marble bathroom. A couple of suites also include spa baths and have direct access to the pool or the beach. Grand Sunset Princess All Suites serves a variety of cuisines, with weekly rotations, for breakfast, lunch and dinner. The seven a la carte restaurants consist of Mamma Mia, Le Fleur, La Vaqueria, Las Olas, La Hacienda and Miso, all serving delectable dishes. At La Fondue, you get to taste excellent Swiss gourmet between 6pm – 11pm. The Chill Out Lounge – Bar Restaurant let you laze at the beach sipping delicious cocktails. With 12 bars spread across the property too, you're spoilt for choice. The hotel features 12 large swimming pools – four paddle pools for kids and a couple of jacuzzis. The fitness centres are well equipped and are maintained by trained professionals. The on-site spa offers a complete range of beauty and wellness treatments. The Funtastic Teens Club entertains young guests between 13 – 17 years. The six tennis courts, a basketball court, an archery area, a football pitch and two paddle courts will definitely keep you engaged during your stay here. The hotel also arranges for introductory Scuba lessons in the pool. During evenings, the hotel arranges live shows to entertain its guests. A must is a visit to coco bongo!! If I’m completely honest, it’s better than what’s shown on the website! The atmosphere was beyond words, I would back here every time I visited Mexico! We loved this Hotel! It had everything and more..would defiantly recommend it. I stayed in this hotel last year. Very good hotel, staff wonderful. Beautiful beach and neighborhood. I recommend everybody stay in this hotel. The food was lovely and lots of friendly staff to help. The shows on an evening were very entertaining, especially for the children. We went all inclusive but there was still limitations on which drinks you could have and also you had to pay to use the beach chill out bar, which was disappointing. Excellent hotel and facilities. Great food , fantastic entertainment. The beach was a let down with a severe weed problem , which you had to wade through to swim in the sea . 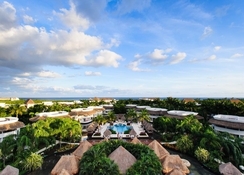 An excellent 4 star all inclusive resort with everything you need for a superb relaxing holiday. From the beautiful rooms to the excellent restaurants with friendly helpful staff, it is a marvelous place for a holiday in the sun.